Professor Stephen Hawking speaks about "Why We Should Go into Space" for the NASA Lecture Series, April 21, 2008. Stephen Hawking was regarded as one of the most brilliant theoretical physicists in history. His work on the origins and structure of the universe, from the Big Bang to black holes, revolutionized the field, while his best-selling books have appealed to readers who may not have Hawking's scientific background. Hawking died on March 14, 2018. In this brief biography, we look at Hawking's education and career — ranging from his discoveries to the popular books he's written — and the disease that robbed him of mobility and speech. British cosmologist Stephen William Hawking was born in England on Jan. 8, 1942 — 300 years to the day after the death of the astronomer Galileo Galilei. He attended University College, Oxford, where he studied physics, despite his father's urging to focus on medicine. Hawking went on to Cambridge to research cosmology, the study of the universe as a whole. In early 1963, just shy of his 21st birthday, Hawking was diagnosed with motor neuron disease, more commonly known as Lou Gehrig's disease or amyotrophic lateral sclerosis (ALS). He was not expected to live more than two years. Completing his doctorate did not appear likely. Yet, Hawking defied the odds, not only attaining his Ph.D. but also forging new roads into the understanding of the universe in the decades since. As the disease spread, Hawking became less mobile and began using a wheelchair. Talking grew more challenging and, in 1985, an emergency tracheotomy caused his total loss of speech. A speech-generating device constructed at Cambridge, combined with a software program, served as his electronic voice, allowing Hawking to select his words by moving the muscles in his cheek. Just before his diagnosis, Hawking met Jane Wilde, and the two were married in 1965. The couple had three children before separating. Hawking remarried in 1995 but divorced in 2006. Hawking continued at Cambridge after his graduation, serving as a research fellow and later as a professional fellow. In 1974, he was inducted into the Royal Society, a worldwide fellowship of scientists. In 1979, he was appointed Lucasian Professor of Mathematics at Cambridge, the most famous academic chair in the world (the second holder was Sir Isaac Newton, also a member of the Royal Society). Over the course of his career, Hawking studied the basic laws governing the universe. He proposed that, since the universe boasts a beginning — the Big Bang — it likely will have an ending. Working with fellow cosmologist Roger Penrose, he demonstrated that Albert Einstein's Theory of General Relativity suggests that space and time began at the birth of the universe and ends within black holes, which implies that Einstein's theory and quantum theory must be united. Professor Stephen Hawking experiences the freedom of weightlessness during a zero gravity flight. Hawking also proposed that the universe itself has no boundary, much like the Earth. Although the planet is finite, one can travel around it (and through the universe) infinitely, never encountering a wall that would be described as the "end." Hawking was a popular writer. His first book, "A Brief History of Time" (10th anniversary edition: Bantam, 1998) was first published in 1988 and became an international best seller. In it, Hawking aimed to communicate questions about the birth and death of the universe to the layperson. He and his daughter, Lucy Hawking, also created a fictional series of books for middle school children on the creation of the universe, including "George and the Big Bang" (Simon & Schuster, 2012). 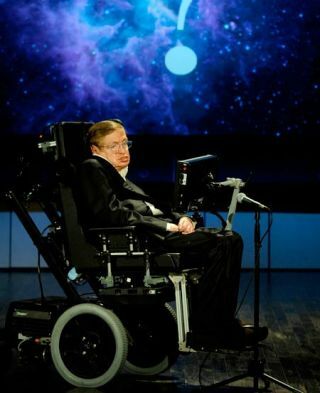 Hawking made several television appearances, including a playing hologram of himself on "Star Trek: The Next Generation" and a cameo on the television show "Big Bang Theory." PBS presented an educational miniseries titled "Stephen Hawking's Universe," which probes the theories of the cosmologist. In 2014, a movie based on Hawking's life was released. Called "The Theory of Everything," the film drew praise from Hawking, who said it made him reflect on his own life. "Although I'm severely disabled, I have been successful in my scientific work," Hawking wrote on Facebook in November 2014. "I travel widely and have been to Antarctica and Easter Island, down in a submarine and up on a zero-gravity flight. One day, I hope to go into space." "Even if there is only one possible unified theory, it is just a set of rules and equations. What is it that breathes fire into the equations and makes a universe for them to describe? The usual approach of science of constructing a mathematical model cannot answer the questions of why there should be a universe for the model to describe. Why does the universe go to all the bother of existing? " "All of my life, I have been fascinated by the big questions that face us, and have tried to find scientific answers to them. If, like me, you have looked at the stars, and tried to make sense of what you see, you too have started to wonder what makes the universe exist." "Science predicts that many different kinds of universe will be spontaneously created out of nothing. It is a matter of chance which we are in." "The whole history of science has been the gradual realization that events do not happen in an arbitrary manner, but that they reflect a certain underlying order, which may or may not be divinely inspired. " "We should seek the greatest value of our action." "It is not clear that intelligence has any long-term survival value. " "One cannot really argue with a mathematical theorem." "It is a waste of time to be angry about my disability. One has to get on with life and I haven't done badly. People won't have time for you if you are always angry or complaining." "I relish the rare opportunity I've been given to live the life of the mind. But I know I need my body and that it will not last forever." A list of Hawking quotes would be incomplete without mentioning some of his more controversial statements. He frequently said that humans must leave Earth if we wished to survive. He also said time travel should be possible, and that we should explore space for the romance of it. "Time travel used to be thought of as just science fiction, but Einstein's general theory of relativity allows for the possibility that we could warp space-time so much that you could go off in a rocket and return before you set out. I was one of the first to write about the conditions under which this would be possible. I showed it would require matter with negative energy density, which may not be available. Other scientists took courage from my paper and wrote further papers on the subject," he told Parade in 2010. "Science is not only a disciple of reason, but, also, one of romance and passion." The theoretical physicist was also concerned that robots could not only have an impact on the economy but also mean doom for humanity. "The automation of factories has already decimated jobs in traditional manufacturing, and the rise of artificial intelligence is likely to extend this job destruction deep into the middle classes, with only the most caring, creative or supervisory roles remaining," he wrote in a 2016 column in The Guardian. "The development of full artificial intelligence could spell the end of the human race," he told the BBC in 2014. Hawking added, however, that AI developed to date has been helpful. It's more the self-replication potential that worries him. "It would take off on its own, and re-design itself at an ever-increasing rate. Humans, who are limited by slow biological evolution, couldn't compete, and would be superseded." "The genie is out of the bottle. I fear that AI may replace humans altogether," Hawking told WIRED in November 2017. An avowed atheist, Hawking also occasionally waded into the topic of religion.